Warning: controversial statement ahead! Marvel’s “Daredevil” owes a lot to The Dark Knight Trilogy, but it might just surpass its gritty, real-world super hero predecessor. Christopher Nolan’s Batman films have trouble blending the filmmaker’s darker impulses with the expectations of a huge blockbuster. As a series not even intended for network or cable TV, creator Drew Goddard’s latest is free from those constraints. It rubs the viewer’s face in the muck of New York City, questioning the nature of vigilante justice: how far is too far? The first season draws on familiar tropes. 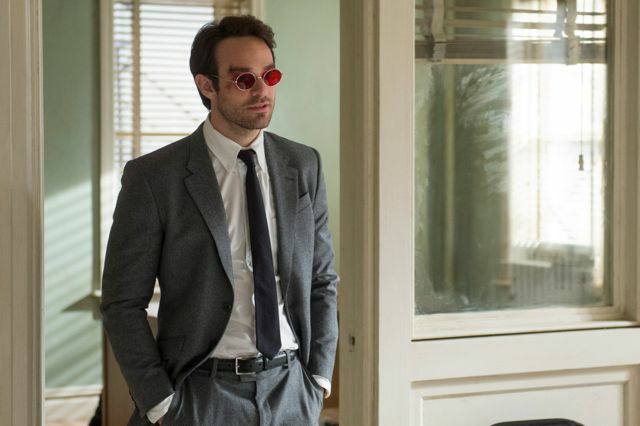 From the outset, we know that a childhood tragedy resulted in Matt Murdock (Charlie Cox) losing his sight and set him on the path to become the titular hero. Flashforward to the present and Matt is in confession. He recalls his father, a boxer, and stories his grandmother told of the Murdock boys. They were headstrong and relentless, they refused to go down without a fight – “there was a bit of devil in them.” Matt asks the priest for forgiveness, “not for what I’ve done, but for what I’m about to do.” Cox is strong in the role. He’s a man with a smooth exterior, but there’s a lot of anger roiling under the surface. The violence in the show is stomach churning – decapitation by car door, anyone? – but never gratuitous. It demonstrates why this type of vigilante justice might be warranted; yet it also acknowledges the cost. Murdoch’s wounds need more than ice packs and band-aids. A nurse (Rosario Dawson) is regularly stitching him up. What kind of man would subject himself to this kind of bodily punishment? Duality between the hero and villain: it’s not just a staple of comics but crime stories as well. The villain here is Wilson Fisk. In his early scenes, actor Vincent D’Onofrio commands empathy. We meet him at an art gallery as he admires a painting. In the next episode, we watch him squirm through a first date. 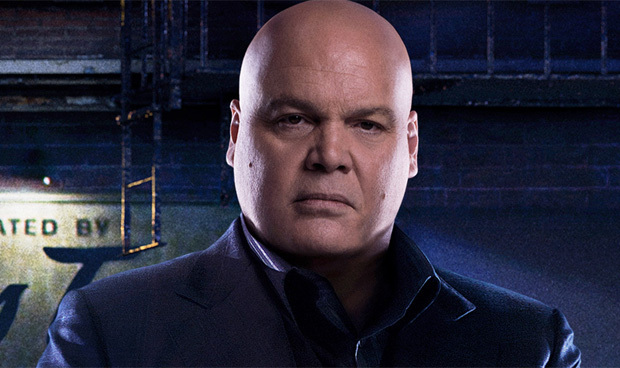 Then we see the consequences of his child-like outbursts, a notion underscored by Fisk’s own backstory and the juvenile gestures he often makes when he’s nervous. Memorable villains have been a struggle for the Marvel Cinematic Universe, but they may just have found one for the small screen. 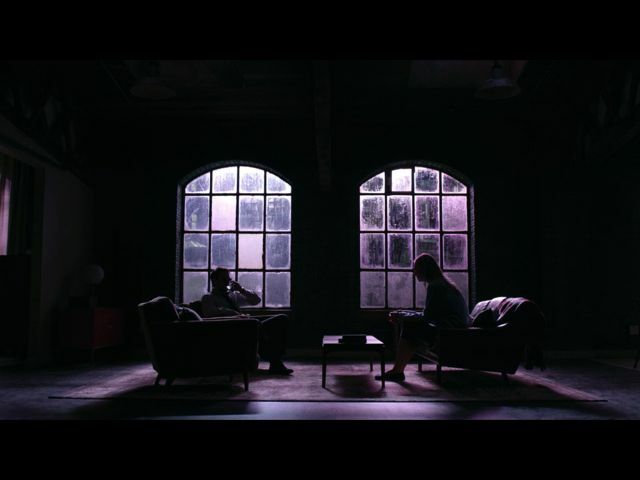 The series has a strong visual signature. Where most of Marvel’s big screen work is lit very flatly (high key lighting for the filmmakers among you), “Daredevil” takes the opposite approach. Shadows are deep and plentiful, but the show doesn’t sacrifice color. Matt starts a law firm and invites a client (Deborah Ann Woll) to his apartment after she’s been attacked. He lives next to an electronic billboard that floods his home with purple-pink light. It’s the only reason he’s able to afford the apartment – no one else wants it – but it’s one of my favorite visual flourishes, creating a safe haven. “Daredevil” is a nice alternative to the safe albeit fun sandbox that Marvel usually offers its viewers. It even bests some of the genre’s more grounded and serious entries thanks to its moral complexity and genuine stakes. Have you seen Marvel’s “Daredevil?” What did you think? Comment below. If you haven’t seen it, the show is available on Netflix Streaming. Check it out!